Boost your sales. Discover opportunities. Be relevant. What's the market share of Shopify? Who's the closest competitor of Magento? What are the recent growth dynamics of RoiStat? Develop your investment strategy based on facts, not buzz. In case you develop sites with Magento, get list of prospects using Magento and offer your solutions. If you are a WordPress plugin developer - there you go with your WordPress-based site list. If you're interested in eCommerce shops with advanced analytics - well, you got it! Find websites which need your technology, but still do not use it. 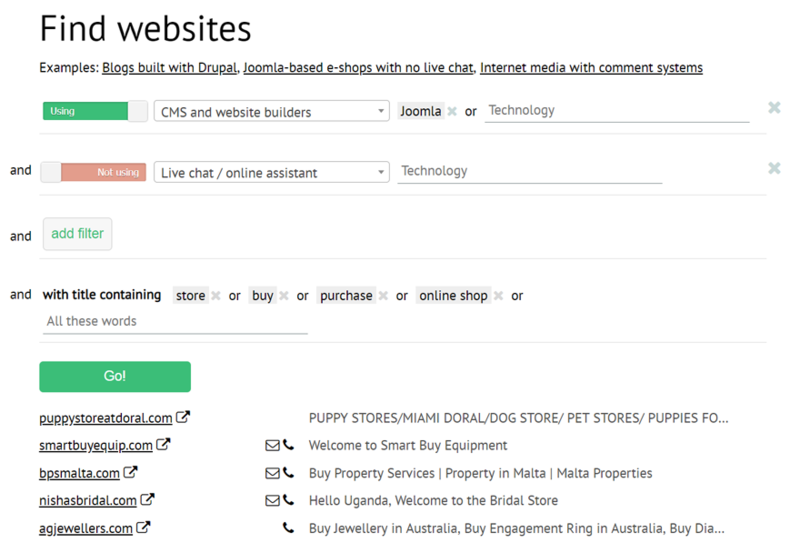 For example, you can find eCommerce websites which still do not use a live chat solution.